Over a week (closer to two weeks) have flown by since I posted last. The reasons are many.....I have been busy, I have been sick(some nasty virus is going around) and among other things, we took a 3-day weekend to visit my daughter in Rhode Island. The weekend weather was perfect. Mornings started off cool and by noon it was downright hot. Dressing in layers and sometimes changing clothing more than once was the order of the day. 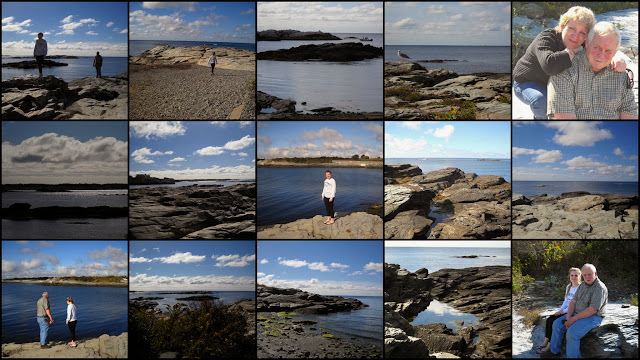 The collage above was of a particularly beautiful spot in Newport, RI that we visited today. We spent some time there climbing the rocks, gathering sea glass and enjoying the view. I didn't want to leave. In three days we covered a lot of territory. 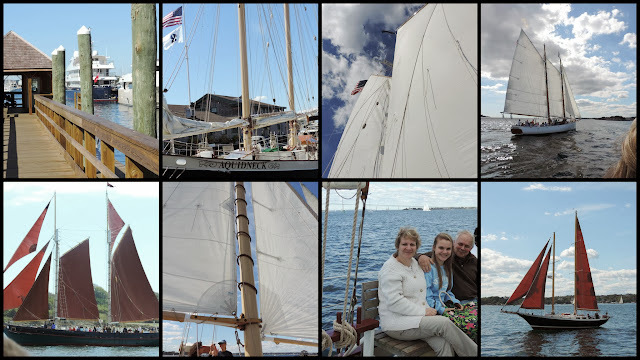 It was so nice to be outside in the perfect autumn weather exploring the area, enjoying beaches, our sailing adventure, shop-hopping and even dining outdoors! We had a wonderful time! I expect life to be back to normal next week. I look forward to catching up on all the posts I have missed over the past few days. My First Note Card Party! I have been passively participating in Vee's Note Card Party since I first happened upon it some time ago. By passively, I mean that I scrolled through photos posted by other participants......and I really enjoyed it!! So this time, I decided to dive right in...make a splash. Pun intended! I visited Vee's blog A Haven for Vee just minutes ago to make sure I was clear on the rules. I am posting four photos that could be used as a set of note cards. These were taken at a beach on Martha's Vineyard! I originally posted these photos HERE. They were taken during a trip to Martha's Vineyard last year while visiting my daughter. Sadly, we did not get to visit the island this summer but I am hoping that we can make time in the weeks ahead! It is such a beautiful place to visit and very relaxing! The sound of the waves crashing on the beach is one of my favorite sounds. I can almost hear it when I look at these photos! I remember that this wave came in a little closer than I anticipated....got a bit damp if memory serves me correctly! Be sure to check out the links I have enclosed at the beginning of this post. One link will take you to Vee's Note Card Party where you can see photos posted by others and you can find instructions for joining the party by posting some photos of your own. that break upon the idle seashore of the mind." I used the "burn the edges" technique and it proved to be somewhat of a challenging process at first. I learned very quickly where to hold the fabric over the candle so that the fabric does not melt into your skin. OUCH! Also, each scrap of synthetic fabric I used burned or melted differently and some (like tulle) melted in the blink of an eye. One fabric petal burst into flames--so having the kitchen sink nearby is an absolute must! The small brown flower is the one I tried first, and the large brown flower followed. 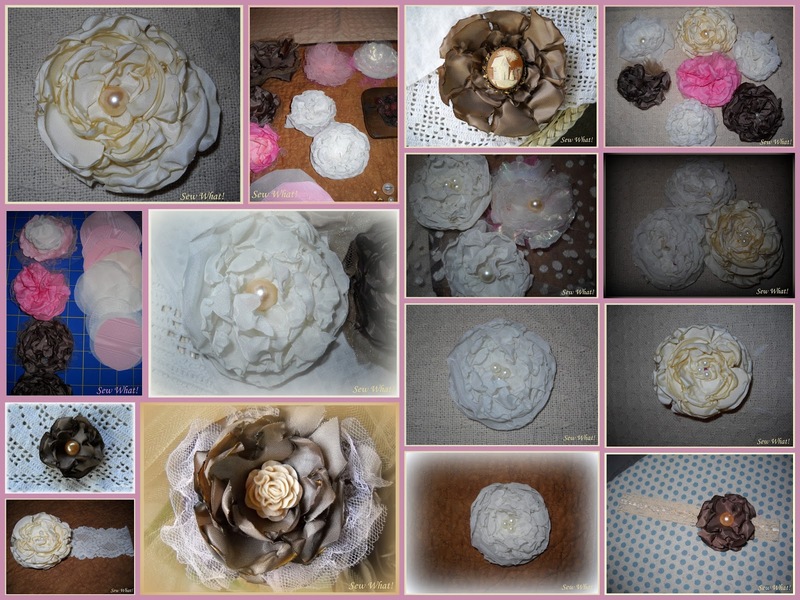 The three flowers in cream and beige were the last flowers I made and they are beginning to look like something I would use in a bouquet. These are fun to make and experiment with. I can think of a million different ways these could be used to decorate or accessorize. Once I get to a point where I have enough blooms that I am satisfied with, I will post them individually. At this point, they are only pinned, not sewn together and I still need to shop for bling to use in the center of each flower. I will start looking for fabrics in my daughter's chosen color scheme to use in the actual bouquet. My Turn for Us: Freedom Friday's #71, Click Here! Check out some of the posts that were featured from last week's party as well. The Sangria and the Pumpkin Roll looked especially wonderful to me! Our strategy worked quite well yesterday. Taking our dog for a walk did improve her behavior (she has been on restricted activity since June due to illness) so we decided to take her for another walk today. If you missed yesterday's walk in the woods, you can see photos HERE. The day started out a bit dark and dreary but then cleared to an absolutely gorgeous day. We walked down an old railroad trail and nature provided many photo opportunities. I was able to capture some beautiful autumn yellows and golds in my photos. It was a fall feast for the eyes! Lots of golden rod (hachoo....excuse me!) and a violet colored wildflower near the top of the photo! These things we do not like.....my other dog Willie, got covered in them once. It took forever to get them out of his long fur! ....fields of gold, so pretty! This was one tall milkweed plant.....it towered over me! Looked like one hungry caterpillar paid it a visit! Here I was wishing I had the camera with the big zoom lens. There on the rock at the center of the river, a very large heron was standing. You can barely see it in this photo. A change in the color scheme....soon the leaves will be sporting shades of red. This tree was covered in what appeared to be wild grapes, except that we could not find one grape on the tree. It was like a little hut. Finally, back to where we started from. What an absolutely beautiful, autumn day! The third one in a row......and here by my side, Ellie is resting quietly. Mission accomplished! Today was not a sew what day--it was a do what day! Here in New Hampshire, we are enjoying Day 2 of PICTURE PERFECT fall weather. The weather was also perfect for a walk in the woods and that is what we decided to do. We took our dog Ellie for a very slow walk as she is still recovering from heartworm treatment and her activity is restricted. Her behavior inside the house has been deteriorating due to boredom and her restricted activity. Yesterday she got into a lot of mischief (she chewed up 3 paint brushes, the upholstery brush to my vacuum cleaner, a pencil, a roll of duct tape, a fairy ornament and a decorative pine cone) so we decided that she needed to get out of the house! She is sleeping nicely beside me right now--such a pleasant change from yesterday's behavior! So I guess the walk worked! This path is not far from my house. It leads to a lookout of the city of Keene, mostly the east side which is where I live. It is a nice walk, especially in the fall. Today it was a bit buggy though. One thing you will learn about me today is that I am fascinated by mushrooms! My husband made fun of me for taking photos of them all, but check out the different varieties I found on my walk today! The one pictured above was very large! It had an interesting trumpet shape to it. Following the trail....it was very quiet, no sound other than the song of some very happy birds. In the past I have walked here and heard owls. Today while snapping another photo, a large owl flew out of a tree and flew up into a higher tree. I think I startled it.Unfortunately I missed catching a photo of it. As I promised, more mushrooms! This is shaped like a flower and has a very thick stem. I know you are probably sitting on the edge of your seats waiting for the next mushroom, so here it is below. This pinkish/red mushroom makes a bold statement on the ground covered in brown leaves. At this point we will be taking a brief mushroom break but you will get to see a few more on the trip back down. I promise! This stonewall was no surprise to me since I have walked this trail so many times. I do love coming upon unexpected picturesque stonewalls in the woods though. They are a common sight in the woods of New England. We are nearing the vista and you can see a clearing through the trees. At this point we always wonder who else will be at the top enjoying the view. Getting closer, we don't hear anyone talking. Could we be alone up here on a day like today? Yup, we are alone. No one is here but us. Usually there are people sitting on the rock and Ellie likes to go over to introduce herself to everyone, get her head patted as she begs for a belly rub. She is a very social dog. This will not be a social outing for her today. The view is calling Ellie and she drags me over closer to the rock. Ellie and I sit down on the rock so we can have a photo taken. Ellie relaxing in the grass. Heading back I noticed mushrooms that I didn't see on the way up! Too bad this one is broken, it was unusual looking....and look how thick the stem is on it. By now my husband is making more comments on my apparent mushroom obsession, comparing my stops to take photos of mushrooms to the frequent stops my dog makes to sniff and, well, tinkle....I beg to differ! This one is neat! I have never seen fungus this color before. It was the color of cheetos! Last but not least, this single leaf says it all. Fall is definitely here! Soon all of the trees will be showing off their fiery hues. I will have to take this walk again when the foliage is at peak. Well, that's it for now. Just so that you know, I am not the only one who takes an interest in fungi. There is actually an entire website called Mad About Mushrooms (madaboutmushrooms.com) I will have to visit the site to see if I can identify the mushroom specimens I found today. AND in case you also happen to be a mushroom maniac, the website even has an online gift shop! My latest tshirt scarf....hold that thought. More on that in a minute! If you read my post from yesterday, this post will make sense to you. If you did not read my original Crossing my Tees post, here is the LINK. I placed the scarf around my neck and the center piece in the flower was just a bit too heavy so I had to replace it with something lighter. I chose the pearl-like center and used hot glue to apply it the the flower's center. On the back side of the flower I attached a pin with hot glue....to be extra sure that it stays fixed in place, I will stitch in on as well. Now I can pin it onto other articles of clothing. Last night I wore it on a white sweater. It was cute! This provided me with a little more eye candy! I love color, texture, etc. Just does more for me visually than the last version. Can you see the braided string in the center? Here is a close up so you can see the braid better. Yup, that was a lot of fun to make! I am going to experiment with some other types of trim and some lacey versions too! Find a Friend Friday can be accessed HERE! My Turn For us: Freedom Fridays. Please click HERE!